One of these things plays well with the other. 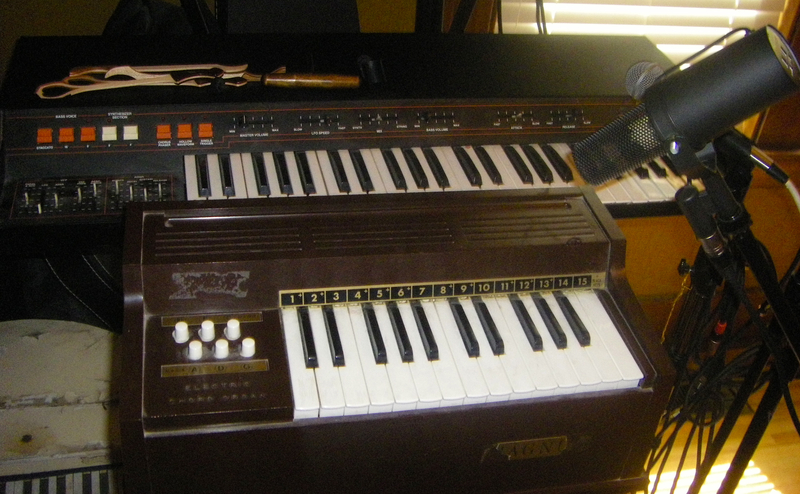 I all but forgot I had this little Magnus reed organ. The last time it got any action was on CHICKEN ANGEL WOMAN, when I had to wedge a roll of yellow electrical tape underneath the fan on the bottom of the thing to get it to stop buzzing so I could record it without losing my mind. With the Acetone combo organ out on loan for a bit, the place where it normally sits was looking a little lonely, so old Magnus there got lifted off the floor where he was hiding, dusted off, and situated where he could be of some use again. Then I started wondering how I was supposed to record it. Back in the day I just pointed an SM57 at the top, but I’d rather use something a little more hi-fi now. A lot of my better mics won’t stretch across the room far enough to do the job, though. And the KM184s would probably be too sensitive and pick up too much of the fan noise (which has mellowed out to a pleasant whirring sound in its old age). The oft-neglected SM7 is sitting right in that area all the time, and that guy’s got a nice long cord. So I popped off the foam windscreen and gave it a try. The results were hilarious. These two were made for each other. The SM7 is a low output microphone that needs a lot of preamp gain, but it’s a great mic, even if I haven’t used it as much as I should have over the years. It’s also directional enough that it doesn’t grab a lot of the fan noise. The Magnus gets pretty loud once it’s warmed up, and the sound might be a little too strident for one of the better LDCs, but this mic likes it just fine. Now I just have to figure out how much I need to adjust the recording speed so this little brown dude will actually be in tune with other things in the universe.